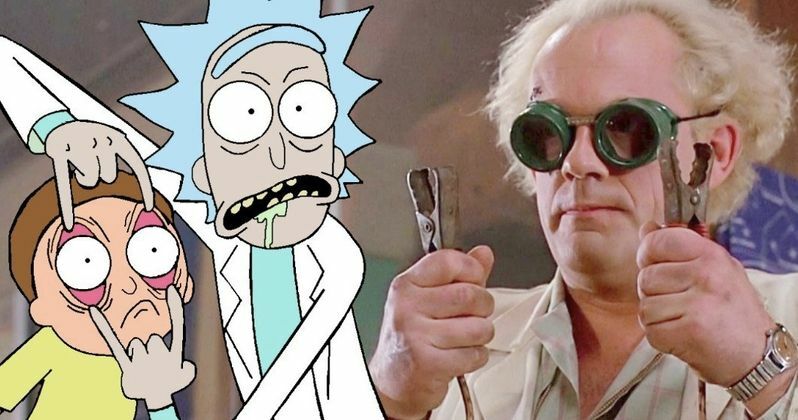 Rick and Morty has its ties to Back to the Future and Christopher Lloyd says that he would be interested in making a cameo on the cult favorite cartoon series. Rick and Morty originally started out as the adventures of Doc Smith and Mharti McDonalds, which was an obvious attempt to troll Universal, who owns Back to the Future. Series co-creator Justin Roiland set out to make a vulgar parody, which later morphed into the hit series that everybody knows and loves today. In a recent interview, Christopher Lloyd was asked about Rick and Morty and he admitted that he has seen a few episodes of the show. Lloyd said, "I think it's a lot of fun. I know it's some kind of parody of Doc and Marty," before being asked if he would ever consider a cameo. Lloyd responded by saying, "I'd like to, of course. I think it's really fun." Hopefully Dan Harmon and Justin Roiland are listening so we can get Lloyd on to the show. As to which role he would play, the interviewer suggested Rick's dad, which made Lloyd chuckle and say, "Yeah, yeah. That'd be fun." Elsewhere in the interview, Christopher Lloyd was also asked about time travel and what he would do if he could go back in time. The actor revealed that he would like to attempt to stop climate change if time travel were real. In addition, Lloyd also stated that he would go back in time to prevent Donald Trump from becoming president after the interviewer compared the president to Biff Tannen and the sports almanac from Back to the Future 2. It would seem that Lloyd gets asked about time travel pretty frequently thanks to the Back to the Future franchise. Adult Swim recently renewed Rick and Morty for a fourth season after Justin Roiland and Dan Harmon negotiated for quite a long time for a better deal, which started to scare some fans into thinking that the show was not going to return. That is obviously not the case since Adult Swim and Roiland announced that there are going to be 70 new episodes on the way. Let's hope that at least one of those episodes will feature Christopher Lloyd as Rick's father. Season 4 of Rick and Morty does not have an official release date at this time, but fans are hoping that the premiere will be sometime towards the end of the year. The longer hiatus from the contract disputes has made the wait for Season 4 a bit longer than anticipated. Writer Ryan Ridley recently stated that he would be surprised if the show came back in 2019, saying that if 2019 is the release date, that it will be late 2019. At least Rick and Morty fans know that 70 brand-new episodes are on the way. You can head over to Phoenix New Times to read more about a possible Christopher Lloyd cameo on Rick and Morty.